One becomes two and from two, many things can grow. Let's enter growth phase 2! Once upon a time, there was a startup named ungleich glarus ltd. This company wanted to use data centers to do crazy things in the canton Glarus. At the beginning of 2017 we created a prototype of a data center. At the end of 2017 we started a crowdfunding campaign to finance the second location in Linthal. The beginning of 2018, the crowdfunding campaign successfully ended. Since then we welcomed new employees, customers and have gained a lot of experience. Now, at the end of 2018, we want to take the next big step for growth. We initially estimated the budget for building a data center successfully as CHF 3'000'000. But instead of waiting for one big investment, we started small and have been growing step-by-step. This Crowdfunding campaign is our second big step toward making Data Center Light a success. Before checking out the goodies, check this flowchart out for finding out the best goodie for you! ungleich glarus ltd was founded in October 2017 and has since hired 4 new employees in the canton of Glarus and we plan to hire more. Our focus is on Open Source, Linux and IPv6 to create attractive products. In this finance round you are again able to buy shares from ungleich. There are shares without voting right (so-called "Partizipationsscheine") and shares with voting right ("Aktien"). The shares with voting right allow you to join and to vote at the general assembly. Both types give you the right for dividends. And in addition to that, we put a nice goodie on top: for every CHF you invest, you get 1 GB cloud storage for free! You can find detailed information about the shares in the Issue Prospectus. Note: unfortunately we are not allowed to offer shares to US citizens. All Swiss banks we talked to refused to accept money from US citizens for buying shares. We are very sorry about that! In 2014 key people of ungleich glarus ltd discovered the canton Glarus and founded the project "Digital Glarus". Digital Glarus is an effort to support digitalisation of the canton of Glarus. In 2015 we opened the first coworking space in Glarus. Since 2018 we collaborate with Spinnerei Linthal, who owns an old weaving and spinning building to offer a second location for coworking. We aim to de-urbanise and give people an attractive workplace in Glarus. 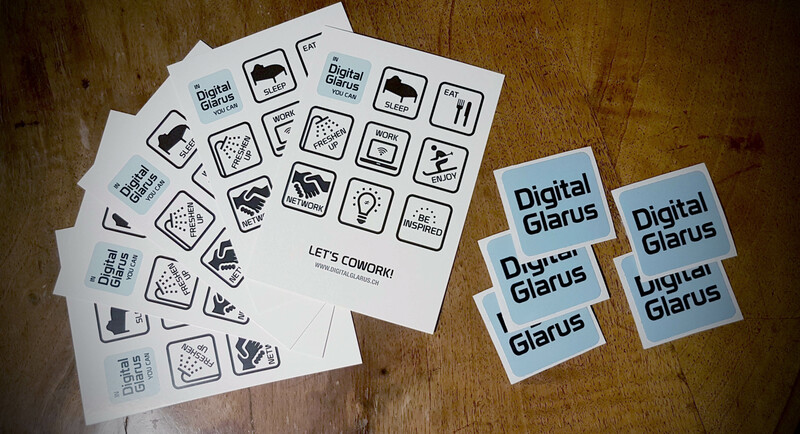 To support the digitalisation of Glarus, we offer you very comfy t-shirts as well as a "Digital Glarus Fan Pack" including stickers and postcards! All our data centers are located in the canton of Glarus, in Schwanden and Linthal. They form the heart of our digital products. Our business model is actually quite simple: we buy servers, ensure that they are running well. Then we rent out computing power ("VPS" or "virtual machines, VMs") and cloud storage. The VMs are suited for running your own services, like a web server, mail server, document server, etc. and required technical know how. For our data centers we reuse old buildings like factory halls. This way we don't waste energy for building new buildings. Furthermore, we don't actively cool. Instead, we rely on the abundance of space in the canton of Glarus. That way, we avoid wasting energy for cooling, as all the classic data centers do. And 100% electricity we use is coming from renewable resources. Most of it is actually produced locally by hydropower plants! So you could say our data centers are three times green! We think that not only the ecological factor is important, but also sustainability. For that reason, all our services are running on Open Source Software and we publicly document our infrastructure. We are very proud to announce our latest product together with the crowdfunding campaign: The Glarnercloud. With Glarnercloud, you can save all your data in the heart of Switzerland, protected by mountains. And not only that: you can easily synchronise the data with all of your devices! It is easy to connect your smartphone, tablet, and computer to Glarnercloud. This way you don't have to juggle hard disks around and you can access your data from anywhere in the world. And we have a small anecdote from ungleich for you: when we started our data center project, we assumed that our main product will be many small virtual machines. For this reason, our first version did only support SSD storage. Then, after we launched, we got the first request for 30TB storage. As we save everything 3 times, this means 90TB of raw storage to provide. Shortly afterward, we got requests from customers for additional 100TB of storage. This is when we decided to create a new product, Glarnercloud that supports managed cloud storage based on HDDs. So things don't always work out as planned but stay interesting nonetheless! IPv6 is the new basis of the Internet. For this reason, we have an "IPv6 first strategy": All our services and products come with IPv6 by default. Most of our products also support the legacy protocol IPv4. However, as a customer you can already opt out of IPv4 on our ipv6onlyhosting.com offer. On ipv6onlyhosting.com you can buy VMs that only have IPv6. If you are in the dire situation of not having an IPv6 connection yourself, we can help you with our IPv6 VPN that enables you to have IPv6 anywhere in the world. And if you want to have a ready-to-go solution for IPv6 in your office, we even have a solution for that: the IPv6 box. Just connect it and all your computers get an IPv6 address instantly! No configuration necessary - plug in and be enabled! If you are a fan of IPv6, you will love our IPv6-Penguin-T-Shirts. They are not only very comfy but turn you into a trendsetter immediately! More IPv6? Yes! You can also get a sticker for your laptop or car, because who does not love IPv6? Check them out: "I ♥ IPv6 Sticker on Twitter"
We would appreciate your support a lot! If you buy a product or if you spread the word about our campaign, both help us a lot. Let's build a great data center offer together! Participate in the success and growth of ungleich glarus ag. The nominal value per share is 0.10 CHF. 5 Digital Glarus stickers and 5 Digital Glarus postcards for Digital Glarus fans. 1-year subscription for a IPv6-and-IPv4-VM with 2 CPU, 4 GB RAM and 20 GB SSD. Your own IPv6 network routed via OpenVPN. Valid for 1 year. 1-year subscription for a IPv6-and-IPv4-VM with 4 CPU, 8 GB RAM and 30 GB SSD. 1-year subscription for a IPv6-and-IPv4-VM with 16 CPU, 32 GB RAM and 100 GB SSD. 1-year subscription for a IPv6 only VM with 16 CPU, 32 GB RAM and 100 GB SSD. 1-year subscription for a IPv6 only VM with 4 CPU, 8 GB RAM and 30 GB SSD. 1-year subscription for a IPv6 only VM with 2 CPU, 4 GB RAM and 20 GB SSD. 1-year subscription for a IPv6 only VM with 1 CPU, 2 GB RAM and 10 GB SSD. Feel IPv6! 100% cotton, front and back printed. Size: S - 2XL. 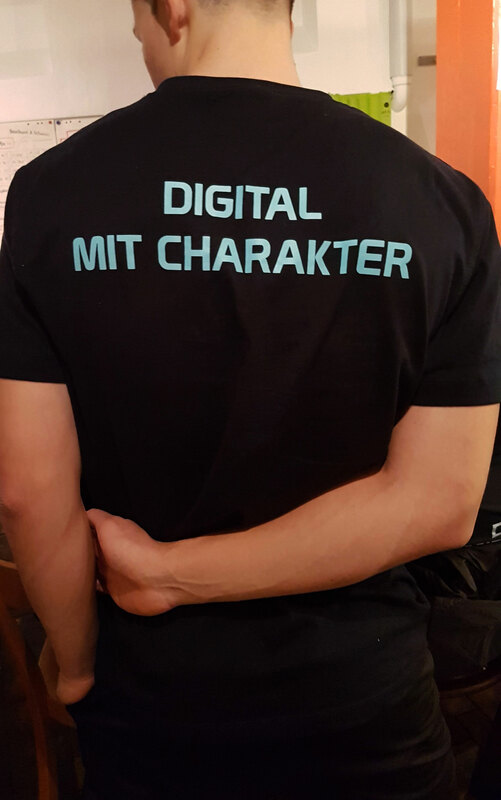 Front: "Digital Glarus", back: "Digital mit Charakter" printed. Dark navy, 100% high-quality cotton. Size XS - 2XL. Show your love for IPv6! Participate in the success and growth of ungleich glarus ag. The nomial value per share is 0.10 CHF. Participate in the success and growth of ungleich glarus ag. The nominal value per share without voting right is 0.10 CHF. Participate in the success and growth of ungleich glarus ag. The nominal value of share without voting right is 0.10 CHF. 1-year subscription for a IPv6-and-IPv4-VM with 1 CPU, 2 GB RAM and 10 GB SSD.